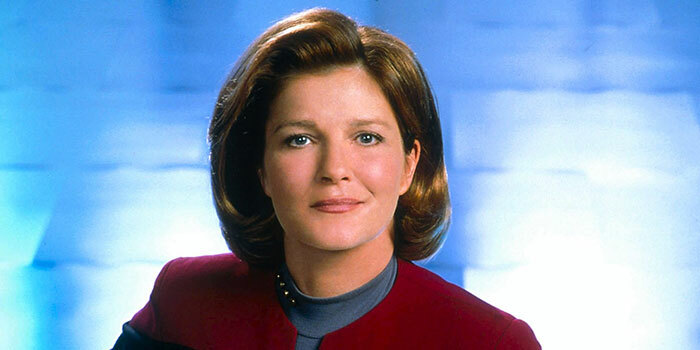 Most Star Trek fans know that Kate Mulgrew was not the original choice to play Captain Kathryn Janeway in Star Trek: Voyager, that in fact, an actress by the name of Genevieve Bujold was. And after filmed footage was released fans immediately took to the interweb to put down Bujold’s performance, but the real question is, was she really that bad? Mulgrew on the other hand, I’ve had the fortune to watch her act in various TV series including Orange is the Black, and having seen her as herself in William Shatner’s The Captains Documentary, I can firmly say Mulgrew is a talented actor. Anyone that has watched Shatner’s Interview with her can immediately tell Mulgrew is worlds removed from ANY character that she has played right down to the minor mannerisms. That means that she creates the Character from scratch and while playing that character lives that characters life. Too often you’ll see an interview with an actor and they’re pretty close to the character they play. Their vocal pitch, stance and mannerisms are basically the same as the character, but not Mulgrew, and right off the bat that makes her an excellent actress. 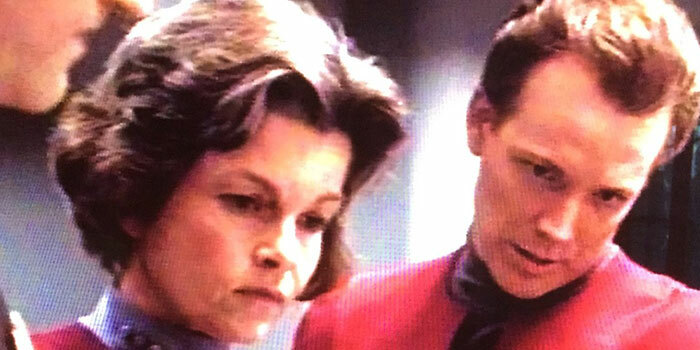 But being an excellent actress doesn’t necessarily mean that actress is right for the part they are playing, and the powers that be, creating Voyager, felt that Bujold WAS number 1 for Janeway, and after watching the released footage I’m not exactly sure why. What was so wonderful in her audition that didn’t make it on screen? I mean just looking at her, her body language is way off. 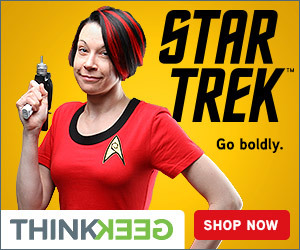 She’s not confident like a Captain should be, like we’ve always seen in Star Trek, she’s shy, timid and unsure of herself… And what’s with her hands? Is she about to go on stage for her first piano recital? Now take a look at Mulgrew. The moment she walks on to the bridge she owns it. 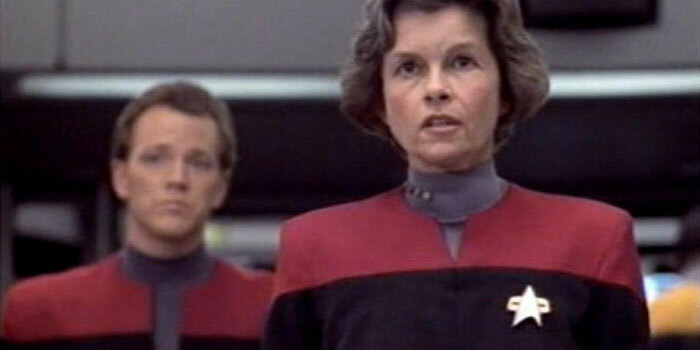 She is confident and most importantly emoting Janeway’s feelings. She is living in that world and living the role. Her face is in a constant state of flux. Showing a depth of character that a normal human being would show. When she’s confused you see it, when she’s happy you see it, there is an immediate connection there. And that’s all down to Mulgrew’s innate acting talent. It’s clear Bujold simply was not happy being there in that role, which begs the question of why she auditioned for it in the first place. It seems almost like a case where a child is begging their parents for months for a specific toy for Christmas. And when they GET that toy for Christmas, they play with it for an hour then don’t want anything to do with it ever again. Bujold lasted for a day and half of the filming before quitting. When asked about it she said, and I quote, “I was unaccustomed to the hectic pace of television filming…” That seems like a diplomatic cop-out answer to me. I mean a seven-year contract, bringing her out of obscurity and to the forefront of a major franchise and she couldn’t handle it? Personally, I would have made myself be able to handle it. Rick Berman on the hand had this to say, ” It was immediately obvious she was not a good fit,” And I completely agree. There was no magic in her performance at all. I picture what she would have been like in other episodes, even though I don’t believe with her as a lead Voyager would have lasted very long. Think Bride of Chaotica or Macrocosm or the Equinox 2 partner, do you feel her flat monotone would have made those episodes the treasures that Mulgrew’s performance made them? The only episode that I think her performance could have really worked with well was Tuvix, she seems quite capable of killing Tuvix for no other reason except that she disliked him. Berman even shed more light on the Bujold crisis in 2006 when he explained that basically, Bujold wasn’t his choice for Janeway, it was that of Jeri Taylor and Michael Pillar who constantly had to assure him that Bujold was right. But Berman lost more and more faith in her when constant problems occurred on the set during the filming of Caretaker. Apparently, Bujold was having trouble memorizing 7 pages of dialogue a day, did not want her hair touched up by the onset hairdressers and even didn’t want to work with directors she didn’t know personally. 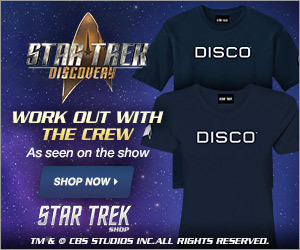 Imagine that, being given a role in Star Trek, for seven years after being pretty much a nameless unknown struggling actress and making a demand like that? What was she thinking? Is she a Diva with an inflated sense of self or was she simply TRYING to sabotage herself in the role? Now I’m not saying that Mulgrew was a perfect person on set, her treatment of Jeri Ryan on set has become legend, but at least that NEVER translated into the role Mulgrew was playing. 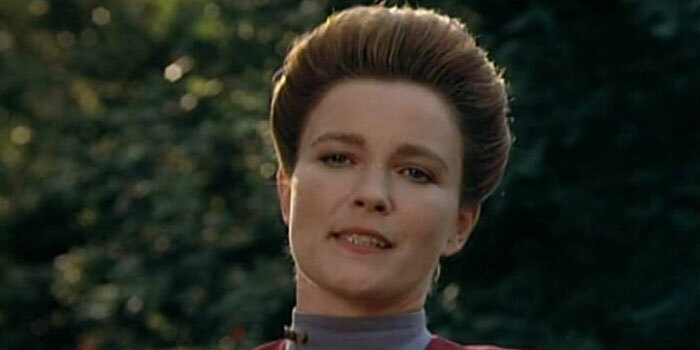 Mulgrew remained professional and did her job excellently, where Bujold was just the opposite.